I’m a dude who was blessed with a good set of vocal chords. I sang in my top college choir, and probably even in an acappella group with some sort of musical pun as its namesake. 2011 is gone, 2012 has arrived, and I need an ensemble that will quench my thirst for choral singing. If so, we’d like to encourage you to audition for Wicker Park Choral Singers! 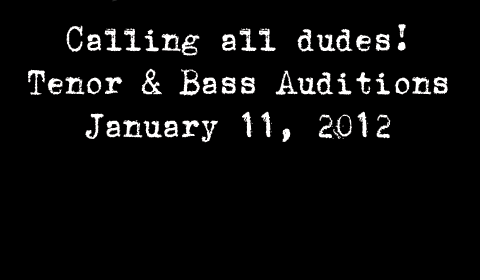 Auditions are approximately 10-15 minutes, and take place in a welcoming and relaxed environment. The audition process consists of vocal exercises, sight-singing, and interval recognition. There is no need to prepare a solo piece. To schedule your audition, or for more information, contact Angela Tomasino at angela@wickerparksings.org. WPCS is an all-volunteer, non-profit organization that believes in providing exceptional choral music that is free and open to everyone. We believe this is the best model to reach the most people possible. Make outstanding music in a collaborative environment with seriously talented musicians. Make friends and network with interesting, awesome people who share your love of singing choral music. Perform in front of large, enthusiastic audiences in famed venues such as St. Vincent de Paul, 4th Presbyterian Church on Michigan Avenue, and Millennium Park. To learn more and listen to WPCS, explore our website!